Former secretary of state John Kerry was interviewed by Bank of America&apos;s Anne Finucane as part of the HUBweek Future Forum. Disavowing the Iran nuclear deal would destabilize the region and isolate the United States, former secretary of state John F. Kerry warned Thursday, a day before President Trump may decertify the agreement that Kerry negotiated in 2015. 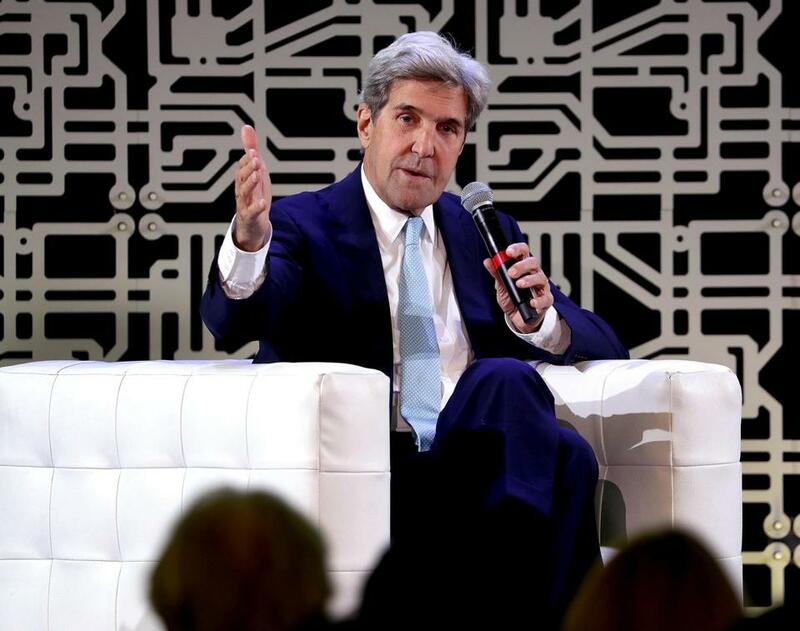 “It is reckless, it is dangerous, it is irresponsible for the United States of America — the proponent of this agreement, the chief negotiator of this agreement — to turn around under a new president and say, ‘I don’t like it,’ ” Kerry told attendees at HUBweek, an innovation-themed festival cosponsored by local institutions and businesses, among them The Boston Globe. In his talk, Kerry also blasted the Trump administration for withdrawing from the Paris climate accord that he helped negotiate. HUBweek rolls into its fourth day with a wide variety of events. But his strongest comments came in defense of the Iran deal, which he spent two years negotiating with Iranian Foreign Minister Mohammad Javad Zarif before it was signed by Iran and six other nations. And if the United States ever had to go to war with Iran, he said, it would make it harder to enlist the support of Britain, France, Germany, and other nations that signed the accord and urged the United States to remain committed to it. The deal is designed to prevent Iran from obtaining a nuclear weapon by limiting its nuclear program to civilian use for the duration of the pact. Kerry pointed out that international atomic inspectors have repeatedly certified — and Trump’s own national security advisers have acknowledged — that Iran is meeting its commitments under the deal. But Trump has lambasted the agreement as the “worst deal I’ve ever seen,” and senior administration officials have said he may announce Friday, in a speech on Iran, that he will decline to certify Iran’s compliance with the deal ahead of a Sunday deadline. If Trump takes that step, Congress would have 60 days to decide whether to reimpose sanctions that were suspended under the agreement, a move that some say could lead to the unraveling of the accord. Kerry said he spoke to Democratic members of the House on Thursday in an attempt to rally support for the deal. Since leaving the Obama administration, Kerry has taken a position in academia, leading a global initiative at Yale, his alma mater. But he has also stirred speculation that he may yearn for a return to politics. In December, he is planning a trip to Iowa, home of the first-in-nation caucus, to speak at a pair of fund-raisers for Tom Miller, his friend and the state’s long-serving attorney general. On Thursday, he was on familiar turf, back in Boston and speaking on a stage with Anne Finucane, the vice chairwoman of Bank of America, who has donated to Kerry’s campaigns over the years. Eight days ago, Kerry was named chairman of the bank’s Global Advisory Council. In opening his talk, Kerry, the famously Brahmin resident of Beacon Hill, made an unlikely endorsement — of the viral video that Eminem released this week, in which the rapper criticizes Trump in sometimes profane language. But he quickly moved into policy matters. On the Paris climate accord, he said he hopes the deal can still be salvaged, despite Trump’s announcement that the United States plans to withdraw from the agreement. “By the way, the pullout is not effective until the day after the election of 2020. So stay tuned,” Kerry said. Ultimately, he said, governments alone cannot curb the devastating effects of climate change. He said he remains optimistic about the future, but said the United States must do more to build roads, bridges, and trains that can move Americans more quickly and efficiently. He said he once rode in a train traveling at 300 miles per hour from Beijing to the coast of China that never jostled the passengers. “Try that on the Acela, folks,” he said.